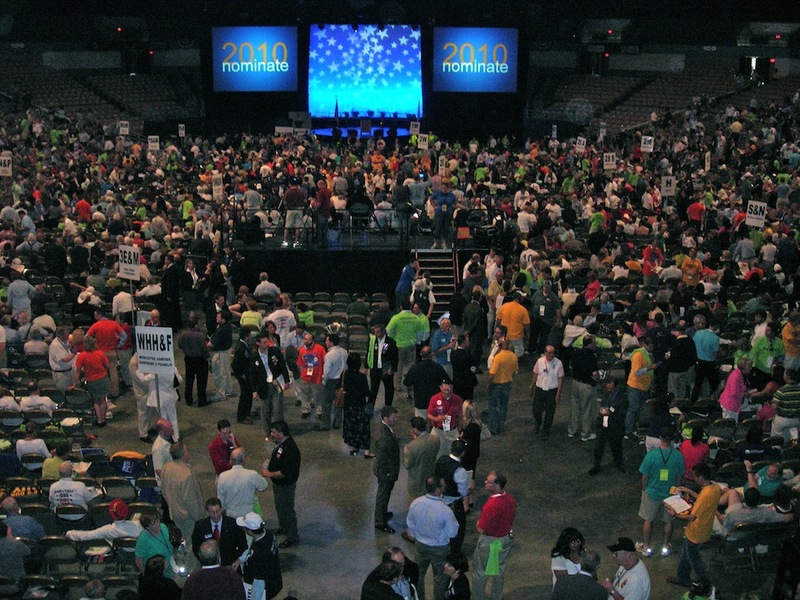 I had a moment of panic when the four of us who’d carpooled together entered the Worcester convention center. Dean sped off to get in line for credentials; Alice left to find the SEIU (Service Employees International Union) reception; I don’t know what happened to Robin. People streamed around me as I stood in the huge hallway, wondering what to do. 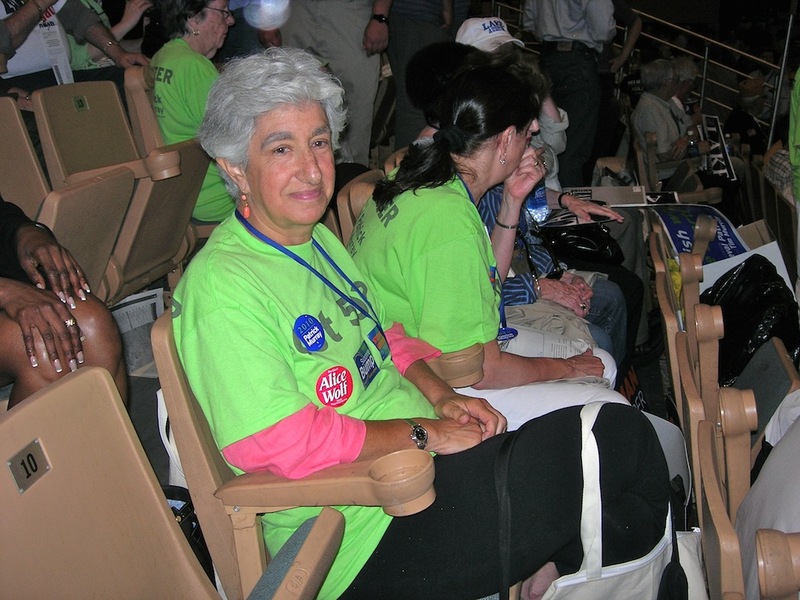 I’d never intended to be a delegate to the Democratic State Convention, the annual gathering of a mere 4,000 party faithful. But at our ward caucus way back in February, when somebody else didn’t show up and my hard-working, good-on-all-the-issues state representative, Alice Wolf, nominated me, I just couldn’t say no. Besides, June 5 was a long way off. Now that it was June, of course I was busier than I’d been in a couple of years and it was a drizzly Saturday morning perfect for sleeping in but I had to get up at 6:00 and suddenly, here I was. When in doubt, hit the women’s room. On the way to the line for that (! ), a man handed me a flyer saying Suzanne Bump had been endorsed the night before by Joe DeNucci, the guy who was stepping down after being State Auditor for dog years and for whose office Suzanne was running. Great news! She’s my choice for the job, so I took a couple of flyers and asked if he had more stickers so I could hand those out, too. They went like hotcakes in the line for the bathroom. 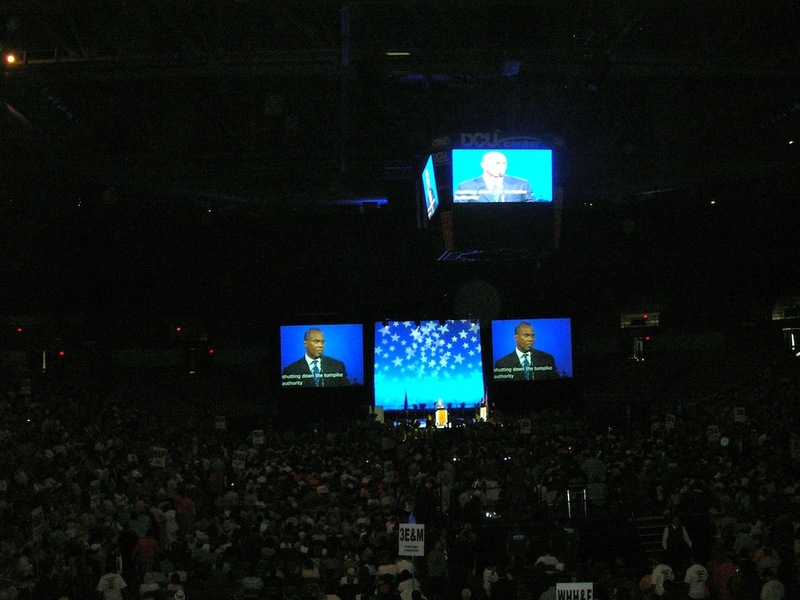 My husband had left for Worcester the day before because, as staff on the Deval Patrick Re-election Campaign, he had important things to do at the convention. The actual things remained mysterious to me, but I knew better than to expect to spend any time with him as he whizzed around doing whatever he had to do. I just figured I’d spot him occasionally in his neon-green T-shirt that said on the front, Got 50? 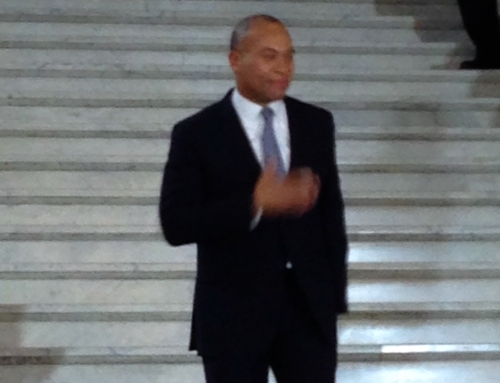 and on the back, Deval Patrick Organizer. 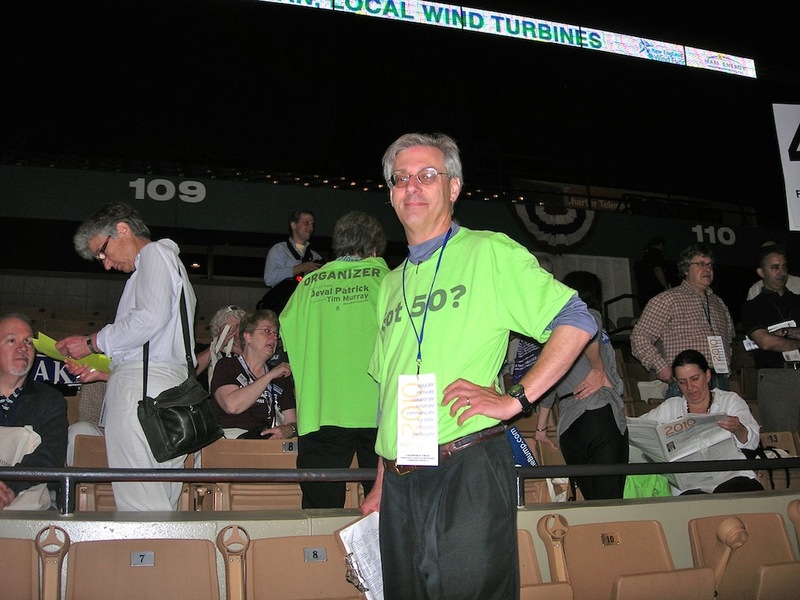 In fact, under my own shirt I wore a tank top so that I could whip off the shirt and replace it with a similar neon-green T-shirt once it was handed out to me at the convention. I had signed up as an organizer days before, which means I have to get 50 people to agree to support the Governor when it comes time to vote in November. Before you enter the actual convention floor (and, yes, it does look a lot like the national conventions you see on TV) you are decanted into the Exhibit Hall where there are many tables lined up and covered with white tablecloths. It’s a nominating year, you see. The Party needs to endorse a candidate each for governor, lieutenant governor, attorney general, auditor and treasurer. It’s kind of a big deal. Especially when a few months ago a Republican made off with Ted Kennedy’s seat in the Senate. To add to those concerns, the races for auditor and treasurer had more than one Democratic running and each candidate had to get at least 15% of the delegate vote in order to be on the primary ballot in the fall. Every one of them also hoped to snag the cherished party endorsement. The endorsement translates into more party support—financial and otherwise—in the primary and more media attention, making it an all-round nifty thing to have. The Governor’s “booth” handed out the coolest buttons. They had a red LED light on them that, later on, looked amazing in the arena when the lights dimmed and all these red dots appeared everywhere. Whoever thought those up deserves a raise. 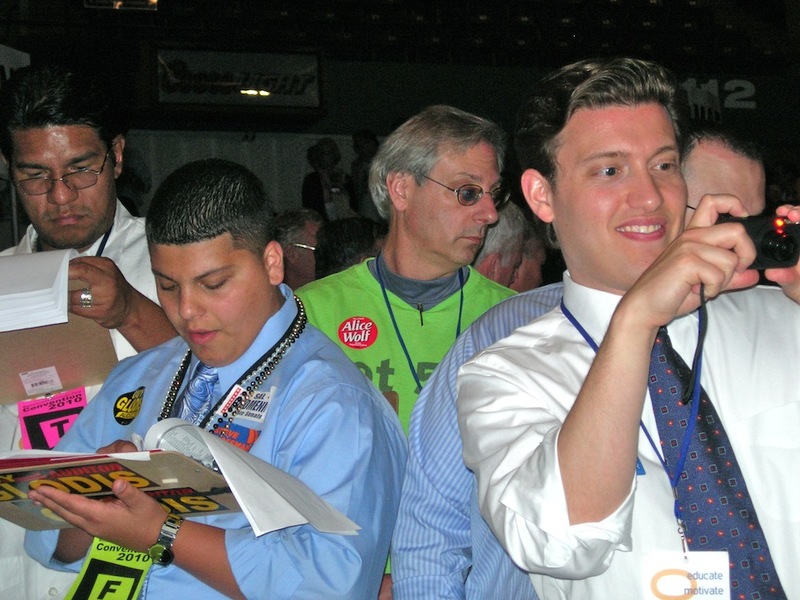 Every candidate had a booth. I came away with bumper stickers, buttons all over my shirt, four hard candies, two breath mints, a new pen and the tote bag. Not bad for a fifteen-minute stroll through a bunch of tables. Best of all, I got to meet Suzanne Bump, my newest heroine, and chat with her and her mother for a few minutes. 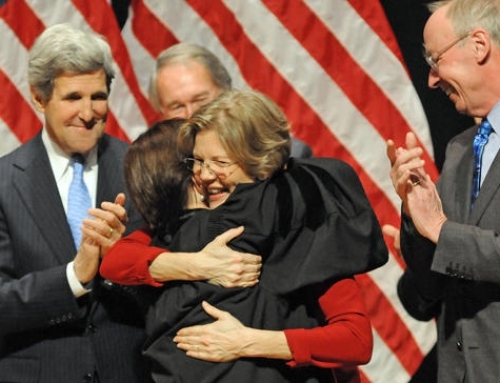 Suzanne’s been a great champion for government reform. 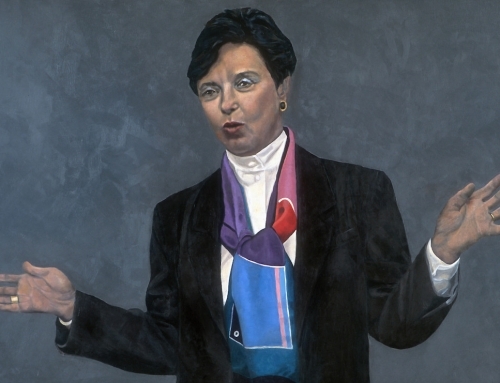 As a legislator she led the charge back in 1991 to rejuvenate worker’s compensation policies so successfully that Massachusetts went from being one of the worst states in the country in this regard to being considered the best. Now, as Secretary of Labor and Workforce Development, she’s gotten twelve different state agencies to actually work together to make employers who avoid paying unemployment taxes, workers’ comp insurance, minimum wages, and so on do the right thing. Again, we’re now a model for other states. I like that kind of record in a candidate. I took more Bump stickers to hand out and a few placards with her name on them to wave at the appropriate time on the convention floor. I didn’t notice it yet, but I was having fun! We weren’t allowed to carry in a back pack, so inside my largest purse I had also packed: a metal water bottle, a pen for voting, the cross-word puzzles my experienced friend Mary Ann suggested I bring for the boring parts, of which I expected there would be many, and a map of the convention floor that told me where I should sit, something called MS&E for Middlesex and Essex counties, or at least the parts of them that belonged to state senator Sal DiDomenico’s district. The item Kate recommended bringing that I was most curious about was “a small flashlight.” Whatever for? Trusting Kate, I packed it anyway. Larry, myhusband, had prepped me that roll call would be taken at 11:00 and everyone had to be in their senate districts seats to shout out “Here!” when their names were called. Otherwise you were marked absent and couldn’t vote later on. I found a seat, dropped my stuff on it, and looked around. Everybody was gabbing, or wandering through the bleachers or around the floor, or wandering and gabbing both. I figured I could do that, too. I was too excited to sit still. I was about to start my peregrination when Larry yelled my name. I looked up to see him about 15 rows above me pointing to a man I hadn’t seen since the Hillary Clinton for President campaign, a wonderful person named Sidi. I excused myself past the seated people in my row, squeezed between standing bodies on the stairs and went up to give him a hug. After catching up with Sidi on life, politics and our daughters, I thought I’dwander over to C&I, Cape & Islands, where my friend Thelma had emailed she’d be seated.I first met Thelma when she called me up early in the Hillary campaign. She’s an activist down to her toes and she wanted to get things moving down on the Cape. Larry and I were interested in doing the same in Cambridge. Thelma and I talked strategy. We talked tactics. We talked about Hillary. We hung up feeling we had each met a kindred soul. I looked and looked. No Thelma. Maybe she had slept in after partying the night before. I knew she’d driven up Friday with friends from Falmouth. I wandered back to MS&E and gabbed with a few other people I knew. This whole visiting-with-people thing was pretty enjoyable. I hadn’t expected that. Since 10:00 when the proceedings began, somebody up on the stage far away had been speaking, either announcing things or welcoming us to Worcester. But everybody in the stands was talking, ignoring the speaker more or less completely. Somehow you sensed when some speech had come to an end and it was time to applaud even when you had only subconsciously registered what they were saying. It’s rude. And it’s hard to talk with your neighbors when someone with a microphone is talking too, not only from the podium but from three huge screens on the stage and four smaller screens hanging down from the center of the ceiling where, during athletic events, the scores were kept. It’s a weird split in concentration; I found it hard to focus completely on the person I chatted with and equally hard to ignore the talk around me to listen to the official speaker addressing me from seven screens. Eventually, somewhat past 11:00, roll call began. A guy in a striped shirt with a clipboard and papers started yelling out names amidst the din. The main stage went quiet, thank goodness, but with all the delegates still talking and the hundred people calling roll and the thousands answering, I worried I wouldn’t hear my name and they’d mark me absent. I was surprised that several names I knew were called and no one answered. I didn’t know you could do that: get elected a delegate and then not show up. Roll call for my ward over, knowing I was now marked present, I got up again. The rows were clotted with bodies and, in order to search for Thelma, I had to hurdle a couple of rows of chairs rather than fight my way through the crowds. One man said he’d been there since Friday afternoon and not seen her anywhere. That worried me. She is, after all, 92. Then a woman told me Falmouth wasn’t part of C&I; it was somewhere else altogether. I combed through several districts but no Falmouth, and no Thelma. Back at my home base, MS&E, Robin, the carpool buddy who had magically appeared in the seat next to me, and I decided to go find lunch. We took our cheddar-cheese-and-broccoli soups to seats high up, directly opposite the stage with an awesome view of the large screens. By now roll call had officially ended and we watched various speakers explain in 3-5 minute vignettes, why they were nominating Tim Murray for Lt. Governor. Then Tim came on and gave an energetic acceptance speech. He looked happy. I was impressed; his speech-making skills have improved in the last four years. 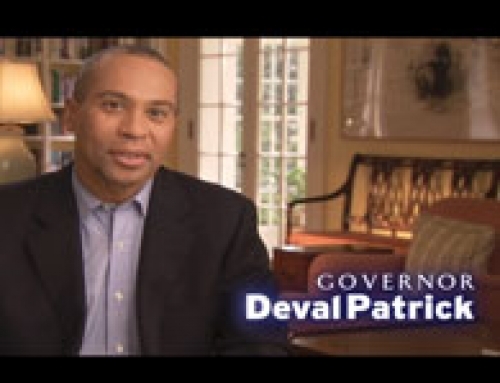 Before The Big Speech from the Governor, others repeated the brief-testimonials- as-nominations process, this time for Deval Patrick. When he strode out onto the stage, the speakers pulsed with that classic foot stomper from Bachman-Turner Overdrive: “You ain’t seen nothing yet B-b-baby, you just ain’t seen n-n-nothing yet.” Bomp! Bomp! I remembered that song. I liked that song. I stood up and danced. The energy level in the arena hit the ceiling. A ton of neon-green shirted staff and volunteers snaked through the aisles like a sinewy green python. 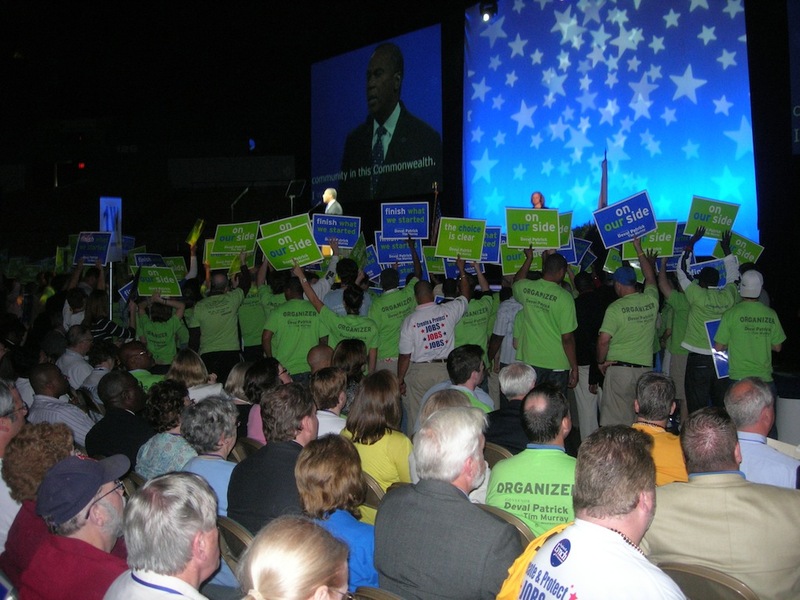 They surrounded the stage so the podium looked afloat in waves of bright green and blue that rose as people applauded and the staff raised their colored placards. This kind of spectacle gets to you through your senses, I realized. It’s energizing and entertaining and it works. When Deval talks, I can’t help but listen. He’s a moving, compelling speaker and I almost always like what he has to say. In this speech, he sounded like a governor should sound. He was a person with a plan, undaunted by the decisions and daily crises that I would find crushing, willing to work on tough problems, still interested in and determined to sort things out. I believed in him all over again, yelling and applauding as loudly as everybody else. Listen to his speech yourself. He and Tim were elected by resounding voice acclamation, an efficient, expeditious process gaveled by party chairperson John Walsh. I left Robin and continued my search for Thelma. After ten minutes, to my delight, I found her. We walked off to find a few seats together where we could sit and schmooze. 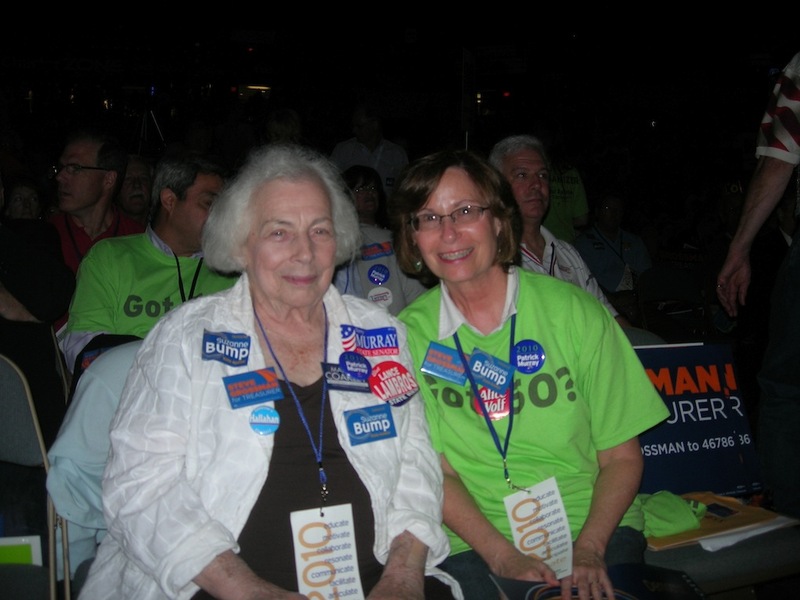 After leaving Thelma, I sat for a while in some empty seats on the floor just for kicks, and listened to the speeches for state treasurer. The Treasurer’s Office, as you might expect, manages the state’s money. Steve Grossman sounded just like the capable, ethical, good guy he actually is and did a good job despite being in the difficult position of following the Governor. I’ve watched him fundraise for other candidates over the years and know how much time and energy he commits to strengthen the Party. Since he would be managing my tax money, I also cotton to the fact that he’s been running a successful company through good times and bad. His competitor was less impressive. Murphy did a lot of verbal wandering, was hard to follow and exceeded his time limit, which we all knew because each speech was timed on the thingie hanging down from the center of the ceiling that normally ticks off the seconds of each quarter in a game. I made my way back to MS&E for the speeches for state auditor. I didn’t want there to be any chance I’d miss out on the voting that would follow, when we voted for both secretary and auditor at the same time. Now that was a smart, time-saving idea on somebody’s part. Suzanne Bump spoke first. She showed a video that I didn’t think was as effective as it should have been, but her speech hit the mark. She sounded experienced and smart, which she is, and excited to be an auditor, which, to my way of thinking, is saying something. What does the state auditor do? A lot more than I ever realized. The Auditor’s Office is supposed to audit all the state’s agencies to eliminate waste and prevent fraud. As if that’s not important enough, the auditor will play a big role in overseeing the spending of the nearly $9 billion of federal stimulus money coming to Massachusetts. Which is why I’m for Suzanne. She’s already done this kind of stuff in her work in the Governor’s Executive Office and I believe people who go into a job with relevant experience under their belts do a better job. Call me crazy. You can read her speech yourself on her website. Mike Lake was up next and he seems like a decent guy, but lacks experience. I knew some people who were voting for him and I didn’t get it. In a state where only 26% of elected officials are women—ranking us 19th in the nation— where we have only one woman in statewide office, Martha Coakley, where only one of our 12 federal offices is filled by a woman (Nikki Tsongas) and where we’ve never had a female governor, how could anyone who believes in fairness not vote for a perfectly qualified, effective, honest candidate who’s a woman? When Guy Glodis, the third contender for auditor, spoke, I confess I didn’t pay much attention. This from a recent article about Glodis sums him up as far as I’m concerned: “…Glodis is on the wrong side of nearly every liberal issue — gay rights, the death penalty, gun control, taxes, diversity — and, more than that, has left a trail of crude comments that gives him a reputation as a piggish, misogynistic boor who would be an embarrassment to represent the party on the statewide ballot. Enough said. His speech is when I learned the value of the small flashlight. I could peaceably do my crossword puzzle while the lights were down. I now have a better sense of what it must be like to participate in a presidential caucus instead of the primary we have here in MA. The roll-caller shouted out your name and you shouted back the two candidates you’d chosen for treasurer and auditor. A young woman behind me was aghast. It was weirdly public when we’ve become so accustomed to private ballots. But I guess this way there’s no chance of anyone’s voting more than once. My district seemed to split pretty evenly for auditor. Several folks around me and I started to fist bump every time someone shouted out a vote for Suzanne, well, Bump. As you might imagine, the process took a while. First off, the caller had to walk to a central location and get the books with delegates names in them so he could record our votes. Why couldn’t he have gotten them earlier? For that matter, why wasn’t it all done digitally? There was a certain romanticism to the process, calling things out, pressing into the crowd to try to hear. It was a little like being on the floor of The Stock Exchange. If anyone wasn’t present to vote, their names got called again at the end to give them a second chance. If they hadn’t shown up by then, too bad. At least that’s how it went in MS&E. Other districts, apparently, went off searching for missing delegates, because they didn’t close the voting until what seemed like 30 minutes after my district had finished. Being Democrats apparently means we hate to have anyone miss out. Drama surrounded the auditor’s race. With three candidates, it wasn’t clear who would win the party’s endorsement. 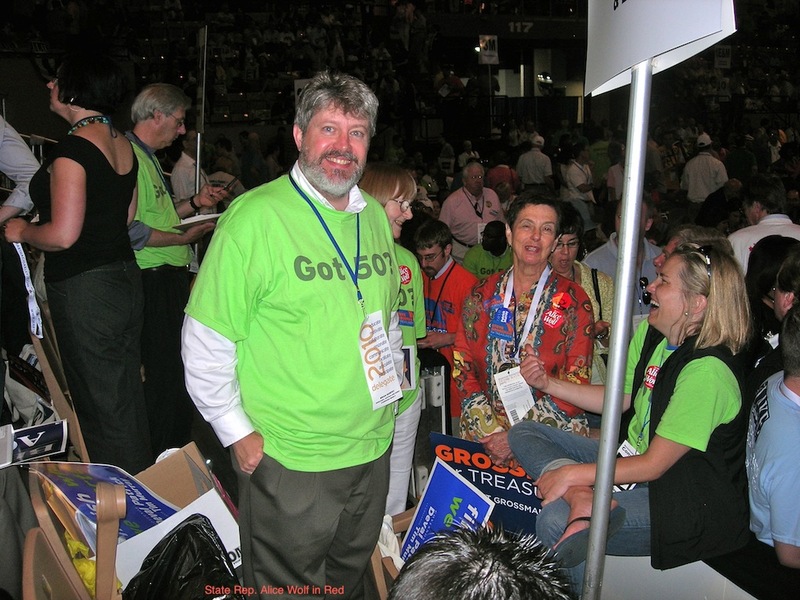 Glodis came into the convention way ahead, and rumors flew that he would encourage some of his delegates to vote for Lake and get him on the primary ballot in September to take votes away from Bump. 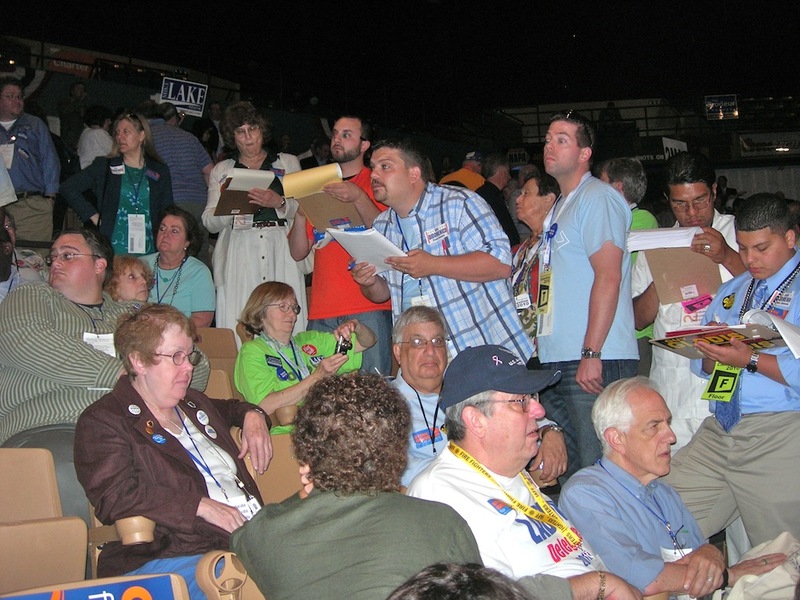 A candidate has to get at least15% of the delegate vote at the convention to be on the primary ballot, but can afford to give up more than that if s/he wants. My district seemed to split fairly evenly among the three candidates, so I wondered how it would all play out. If no candidate got 50% of the vote, there would be a second ballot for party endorsement in which the candidate with the fewest votes would drop out and we would all vote again between the top two. By this point, it was after 4 p.m. and my carpool mates and I were ready to go home. I’d guess about a third of the delegates had left. Much debate ensued among us about whether to go or stay in case there was a second vote; three of us were Bump fans. We finally agreed to leave. As we walked out of the arena, a young man wearing a Bump T-shirt and headphones, noting our Bump stickers and buttons, intercepted us. He said he’d just been told to ask supporters to stay because they’d just learned no one had received the required 50% to win the endorsement and a second vote would be called. We went back to our seats. On the up side, we got to hear the tribute to Teddy Kennedy. As votes were counted, we heard speeches from folks who knew and loved him. Senator John Kerry gave the most moving talk I’ve ever heard him make; it was wonderful. 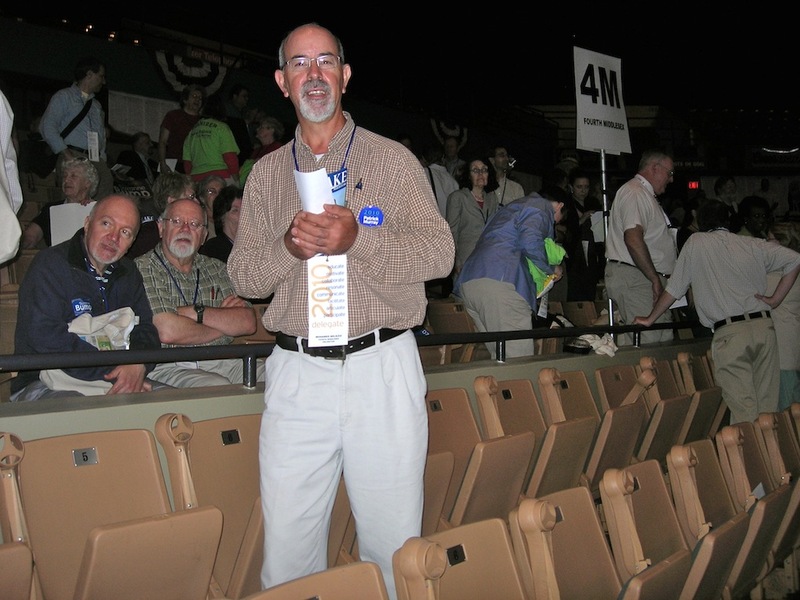 By the time Vicki Kennedy came to the podium, I had forgotten all about the balloting. She was marvelous. In the car ride home, we agreed we wished she’d run for office. Then we watched a video with lots of black-and-white clips of the young Kennedys interspersed with the older Ted. Many, like myself, had to wipe our eyes. We still waited for the second vote. Finally, we got word that Bump and Glodis had each gotten 37% of the vote and agreed to forgo the second vote because it was so late. As we left, people speculated that the two candidates weren’t sure that enough of their supporters remained to vote. I was sorry Suzanne Bump didn’t get the Party endorsement but delighted that she had, unexpectedly, gotten even a few more votes than the forerunner Glodis. The upset should create some additional momentum for her campaign. As we drove home, I was quiet as the others talked housing issues and legislation. I’d just put in eight hours at my first state Convention and I hadn’t spent any time at all being bored. In fact, I had enjoyed myself! If asked, I’d be happy to come again . . . at least in a nominating year.